sure wish i'd've invented the handy little gadgets - you have no idea how many times they've come in handy for other jobs - i used one once when i was in college to hold a little arm together on my carburetor on my vw bug so i could get home! you cannot put a price on a paperclip - oh no you can't! Paperclip earrings? I had no idea you were so PUNK! LOL! I didn't know that about Norway and paperclips. Nice connection. Happy Blogiversary! Thank you for enlightening me about the paperclip. I didn't know its history. btw...my blog, itself, is just coming up on three years now....but the website that runs along side it is 5 years old. You're welcome to stick around. by staples, i'm sure he means potatoes and rice. You start serving Farmer John potatoes and rice and you'll NEVER be able to get rid of him! "You start serving Farmer John potatoes and rice and you'll NEVER be able to get rid of him!" ...I will keep that in mind, as well. Of course, these kinds of staples don't hold papers together very well. oh, i don't know - a little rice paste is known to do wonders! i see you've met berty-girl and alice! I thought they might drop by. The three of us are practically related! Now, I wonder where the boys are? Who you calling a boy, FJ? He must have been eyeballing you in a cold shower, blueboy... and don't start talking 'bout shrinkage, again! Hi, Kelly, glad to meet you! What's the muse doing here? nanc and Kelly are mates, Huge-O. Now scram. You've had your introduction and flashed your IP. Nope, still not broke, kelly. I've got four more friends, but they're very low profile. Hey, all, take a look over at Republicus...he could use some support on his story. FJ: "Now, I wonder where the boys are?" You mean John and Phelonius?....hmmmmm...now where are they? oh..John did show up...earlier...my apologies to him on that. Phelonius probably got caught up in the beautiful Texas spring time. I sure wish spring would come to Utah. We had ONE day that was such a teaser that it was cruel...CRUEL!! I say. 82 degrees...now its back down to 32 degrees...BAH!! Sounds like you're having the same weather in Utah that we are having in MD. I go from buds to cherry blossoms and visa versa every weekday... I can't wait till the cherry blossoms have fallen all round! FJ, I miss seeing the cherry blossoms and the dogwood blossoms. I spent one very nice spring in Virginia. Every time I tried to get a picture of them the camera just didn't capture the beauty of what my eyes saw. Kelly, I can't believe it's been over 5 years now that your web site was born. Just think, if I had kept MY web site that YOU helped create, it too would have been 5 years old. Someday, may I learn to be as ummm, stable as you are in all areas of my life! Perhaps then I can achieve happiness???!!! 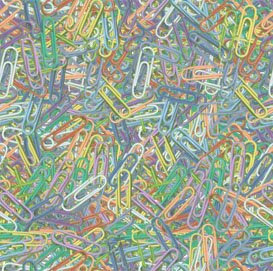 Do any of your children have a love for paperclips as you do? kell - i'm still waiting for you to open john's present! Starla...now you can keep the blog you just got going. YOu never know what it will bring into your life or where it will take you.